Notes: The hill fort has a dedicated free car park located at the end of Maiden Castle Road and is sign-posted. Dogs need to be kept on leads as livestock grazes throughout the fort. A large hill fort with a complete multivallate ditch system that encircles it. The whole site remains undeveloped and can be explored freely. The ramparts give spectacular views of the surrounding countryside. Hill fort is managed by English Heritage. 1. A “war cemetery” was discovered in the Fort where the bodies of multiple Iron Age warriors who had clearly been killed in combat were discovered. Most had horrific injuries that may have been inflicted when the Romans attacked or alternatively they could have been victims of local skirmishes. 1. The River Axe seems to have acted as the western boundary for the Durotriges, the tribe who probably occupied Maiden Castle by the first century AD. Their territory extended westwards including all of Dorset and parts of Devon, Somerset and Wiltshire. Even today the multivallate ditch system and high ramparts of the Iron Age hillfort at Maiden Castle never fails to impress. Originally a more conservative affair the fort expanded as it came to dominate the local area but, despite the defences, failed to stop the Roman Second Legion who stormed it in AD 43. Maiden Castle, the name deriving from the Celtic word 'Mai Dun' meaning 'Great Hill', was built around 3000 BC. The original fort was much smaller than that seen today with just a single ditch enclosing just one of the hilltops. In all respects the fort was not much different from the myriad of similar hill forts littered across the country. Around the fourth century BC the castle underwent massive expansion; the perimeter of the fort extended to include the adjacent hilltop and the defensive earthworks were upgraded with the three ditch system seen today. Whether this was due to defensive requirements or was just for symbolic purposes, i.e. to articulate Maiden Castle’s importance as an economic or administrative hub, is unknown. Following the Roman invasion of AD 43 the Second Augustan Legion (Legio II Augusta), under the command of the future emperor Vespasian, swept through the South and West Country. 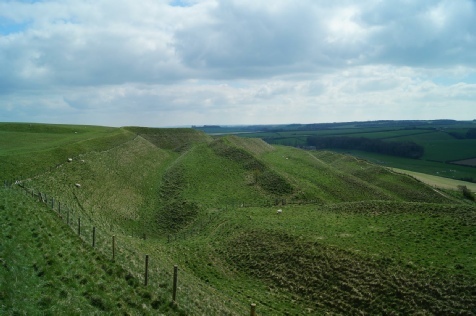 They assaulted and seized multiple hill forts and, from archaeological evidence (including a Ballista bolt lodged in a human skeleton), Maiden Castle was one of the targets. Inhabited at the time by the Durotriges tribe, the seemingly impressive defences were only a fleeting obstacle to the Roman military machine. The castle was taken, the earthworks slighted and the populace forcibly relocated to modern day Dorchester. Post the Roman assault only periodic use was made of Maiden Castle thereafter. The late Roman era saw a Temple built in the grounds and the castle may have been reoccupied for a period during early in the Saxon era. However, for the bulk of the last 1500 years it has been used for nothing more than pasture grazing.